For a comparison of Laparoscopic Duodenal Switch click here. Dr. Ara Keshishian would prefer to help you understand the extent of your particular case, and how different surgical options may have more benefits than others. If you have questions, he is glad to answer them and help you understand your options. Educating our patients is one of our highest priorities. When it comes to your health, having experience is key. Dr. Ara Keshishian has performed more 2,000 Duodenal Switch procedures using the method described by Dr. Douglas Hess (percentage based method blog) and more than 500 revisions from other Weight Loss Surgeries such as RNY Gastric Bypass, Adjustable Gastric Band, and Sleeve Gastrectomy to Duodenal Switch over the last 18 years of private practice. Laparoscopic Duodenal Switch is a hybrid surgical procedure that has two aspects that reduce weight, restriction and limited absorption. Duodenal Switch maintains the pyloric valve and the gastric and intestinal junction, which eliminates dumping syndrome, marginal ulcers and stoma issues that are associated with Gastric Bypass. Duodenal Switch has the highest excess weight loss and maintenance of all available weight loss surgeries at this time. You may view a comparison chart here. 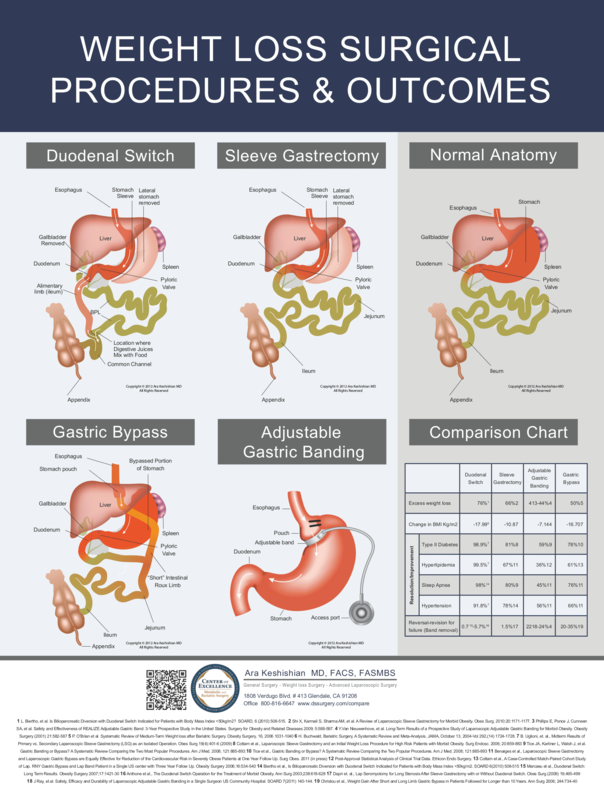 Duodenal Switch as described by Dr. Hess using a percentage based method for constructing the intestinal limbs offers the most individualized and customizable weight loss surgery. The smaller stomach size limits the amount of food that can be taken in to about 120-150cc (1/2-3/4 Cup). This results in not only a greatly reduced volume of the stomach, but also reduces ghrelin, a gastrointestinal hormone that plays a significant role in appetite regulation and control. The small bowel is reattached in such a fashion as to keep the biliopancreatic juices away from the food until the last portion of the small bowel, limiting the absorption of the food that is eaten. 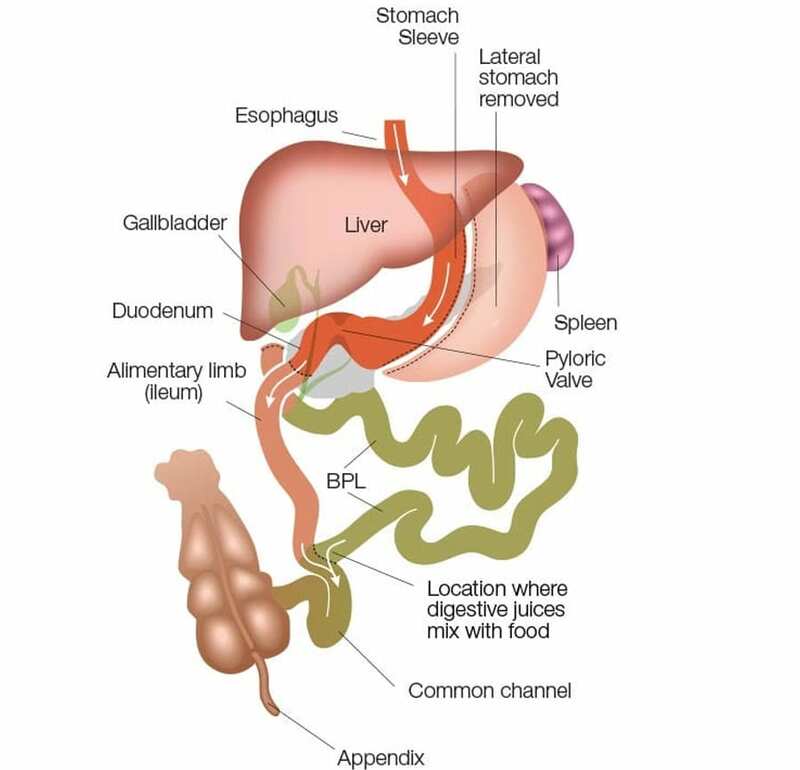 The stomach is decreased in size by doing a Sleeve Gastrectomy, which uses proportional amounts of the stomach areas that make important enzymes and chemicals. The hallmark of the Duodenal Switch operation is the preservation of the pyloric valve. The pyloric valve is at the last portion of the stomach and acts as a gateway to the small bowel. The food needs to be of the right chemical and mechanical consistency before the pyloric valve allows it to progress into the small bowel. The appendix and the gallbladder are also removed. Duodenal switch provides the best remedy for failed gastric bypass. When necessary, the revision or reversal of the Duodenal Switch operation is technically the safest and easiest of all revisional surgical procedures.